Yanome is a suburb of Fukushima town. Now Watanabe Hiroko 渡辺浩子 makes them in the town. 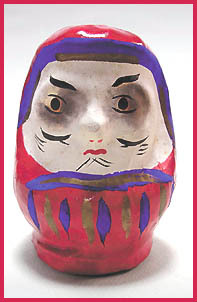 A kind of Tomioka papermachee dolls 富岡張子. They are made since about 130 years ago, when the first doll maker went to Miharu and started how to make them. 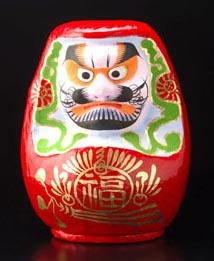 He produced Daruma to improve his meager income from farming. Now the family tradition is in the fourth generation. Later after the war they started to make other kinds of papermachee dolls. A speciality is the use of the blue color. 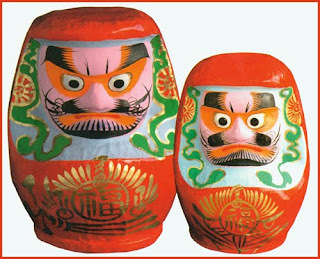 The face is a bit similar to the Miharu Daruma. Now the widow of the last craftsmen keeps the tradition.
. . . CLICK here for Photos of Hariko ! They come with the eyes painted in and stare at the enemy and bad luck until good fortune comes your way. The brows are like cranes, the beard in the form of a tortoise. The face is framed with a green pattern that looks like a dragon. It is thus used to protect from fire. During the Edo period travel along the river Abukumagawa 阿武隈川 was frequent and together with the tax rice Daruma dolls were shipped around. with a length of 234 km, is the second longest river in the Tōhoku region of Japan and the 6th longest river in Japan. It runs through Fukushima Prefecture and Miyagi Prefecture, rising from springs in the peaks of the Nasu mountains, collecting water from tributaries leaving the Ōu Mountains and the Abukuma Highlands (阿武隈高地, Abukuma-kōchi), then emptying into the Pacific Ocean as a major river. The Abukuma River flows north through Fukushima Prefecture's Nakadōri region, past the cities of Shirakawa, Sukagawa, Kōriyama, Nihonmatsu and Fukushima. The portion of the river flowing between Nihonmatsu and Fukushima forms a deep ravine called Hōrai-kyō (蓬莱峡). The famous poet Io Sogi (Soogi, Sougi 飯尾宗祇　いいおそうぎ) on his way to a poetry meeting for linked verse in Northern Japan met a poor girl here selling cotton. When he started talking to her, she answered him with a perfect waka verse. He felt quite ashamed at this and went back to Kyoto without attending the poetry meeting. Pushing towards the north, I crossed the River Abukuma, and walked between the high mountains of Aizu on the left and the three villages of Iwaki, Soma, and Miharu on the right. . . Located in the Abukuma Keikoku 阿武隈渓谷 ravine of the Abukuma National Park. It is a temple of Shugendo and the Yamabushi 修験山伏.